Join Prison Yoga Project founder James Fox to learn evidence-based yoga, pranayama and meditation practices that have been proven effective for prisoners, as well as strategies for establishing trauma-informed yoga classes in detention centers, rehab facilities and more. 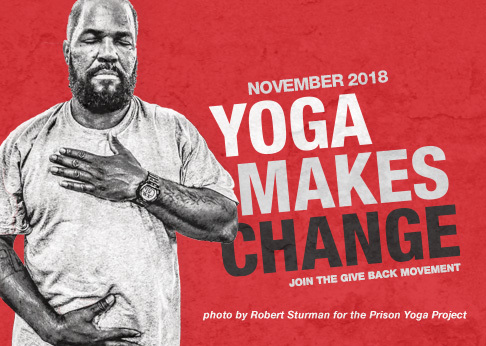 Prison Yoga Project’s unique weekend trainings are open to anyone who is interested in bringing yoga to underserved or at-risk populations. Find venue and registration info below. This special training is for yoga teachers and committed yoga practitioners who are interested in working with people who have been impacted by trauma. The two-day training will be led by Prison Yoga Project founder and director James Fox, who has more than a decade of experience in teaching yoga and mindfulness to incarcerated youth and adults at San Quentin State Prison and other rehabilitation facilities. ~ Learn about Prison Yoga Project’s evidence-based, trauma-informed methodology for working with prisoners, including an in-depth orientation for teaching yoga in the unique socio-cultural environment of prison. Prison Yoga Project trainings are generally two-day intensives held over the course of a weekend, offering 12 hours total of instructional time. To view the most recently added dates across the country and internationally, visit PrisonYoga.org. Partial scholarships are often available. Review each training description for more information on how to apply for a scholarship, and to learn about Prison Yoga Project’s refund and wait list policies. Learn more and find a Prison Yoga Project training near you.